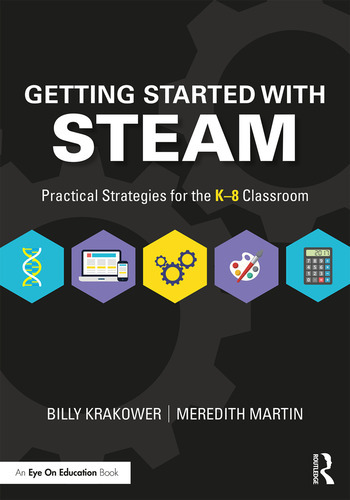 Learn effective ways to teach STEAM with this helpful book from educational technology experts Billy Krakower and Meredith Martin. Whether you have a dedicated STEAM class, or plan to integrate it into a regular classroom, you’ll find out how to create a structured learning environment while still leaving room for inquiry and innovation. You’ll also gain a variety of hands-on activities and rubrics you can use immediately. taking your class to the next level with design thinking. With this practical book, you’ll have all the tools you’ll need to create a STEAM-friendly learning space starting now. Continue the conversation on Twitter with the hashtag #GSwSTEAM! The Jargon Jungle: Makers, STEM, & STEAM - What’s The Difference? Billy Krakower is an internationally recognized education speaker, trainer and author of several books including Connecting Your Students with the World (with Jerry Blumengarten and Paula Naugle). He can be found at www.billykrakower.com and followed on Twitter @wkrakower. Meredith Martin is a Certified Google for Education Innovator and Trainer.